REEL REWARDS: Local fisher Nathan Wright snared this salmon over the weekend. Fishing conditions over the last week have been far from ideal but those who did get out were rewarded with good fish. The inner harbour again offered some decent land-based fishing with bream still on the bite and Australian salmon making an appearance. For the bream, freshwater yabbies were a favourite bait when cast near structures like piers and boats and the salmon took a liking to soft plastics a bit further out. Pinkies and flathead can still be expected for those fishing with a soft plastic or bait. 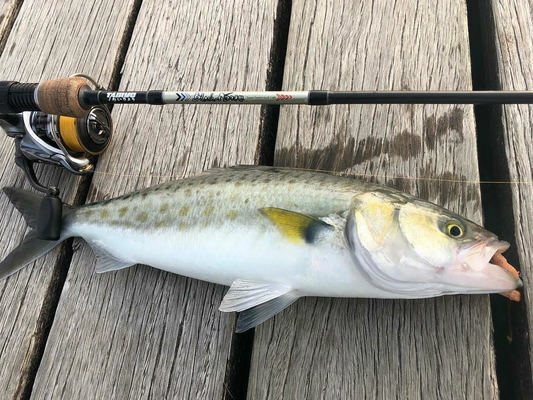 Anglers seeking cover around the Bellarine Peninsula found fish inside the Portarlington boat harbour and again the conditions restricted most fishers to being land-based. Using soft plastics or blue bait, anglers managed to snag pinkies, salmon, flathead and trevally. Find somewhere in the harbour where the wild winds we’re experiencing will be behind you, and this will assist in long casts and covering more water. Squid can also be caught in the harbour with calmer days being preferred. Down the coast and salmon were on the bite in the surf from Bancoora Beach all the way to Apollo Bay. Casting metal lures from 30-60 grams into the gutters saw some anglers bag out on salmon to around 2kg. Staying down the coast, the small estuaries along the Great Ocean Road have produced big bream on freshwater yabbies, scrub worms and prawn as bait. Painkalac Creek in Aireys Inlet was a hot spot, in particular the stretch of river behind the shops to upstream at the fishing jetty on Bambra Road. Some decent freshwater fishing occured across the region, with anglers at West Barwon Reservoir in Forrest catching brown and rainbow trout up to 1kg. Using lures like Tassie Devils and even soft vibes was effective. Worms and mud-eyes fished under a float has always been a productive way of fishing the dam as well. Lake Tooliorook continued to fish well for brown trout, as the weather again restricted most fishing to land-based. Fishing bait off the jetty at the ramp was productive and Powerbait was the standout. Lake Purrumbete is the pick of the two crater lakes this week with trout and redfin both still biting well.